Visit the Sanctuary Visitor Center in Maui. Hours are Monday through Friday from 10:00 a.m. to 3:00 p.m. 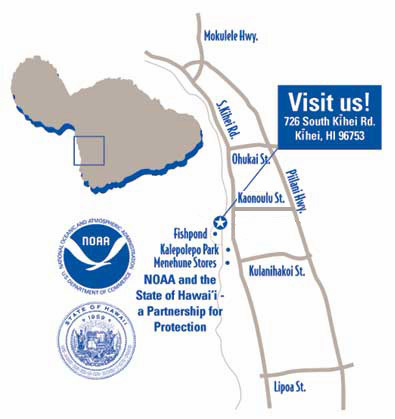 In addition, the 45 ton humpback whale talk takes place on Tuesday and Thursday at 11:00 a.m.
Take Highway 380 W, turn left on Puʻunene which turns into Highway 311, then turn left (South) on South Kīhei Road to 726 S.
Take Highway 30 to Māʻalaea, turn right on Highway 31 N. Kīhei Road, then turn right on South Kīhei Road to 726 S. Kīhei Road. The sanctuary's Honolulu office is located at the NOAA Inouye Regional Center. The Honolulu office of the sanctuary houses many of the sanctuary's administrative staff including the Sanctuary Superintendent. The office serves as the base of operations for the Sanctuary Ocean Count project and also serves as a venue for scheduled volunteer training, workshops, and meetings. Education and outreach materials are available. Take H-1 towards the airport and take the exit 15A "Arizona Memorial". Follow Kamehameha Hwy. (#99), go past the Arizona Memorial entrance. Take a left turn onto Ford Island Blvd. Once you get through the security checkpoint, drive over the bridge. At the roundabout take the second exit. You are now driving on the right hand side of the runway. Continue until you see the "NOAA Inouye Regional Center" sign on the right side. Plenty of parking is available. Take H-1 eastbound and take exit 13A for HI-78 toward Aiea, merge onto HI-78 West/H-201, take the exit toward Stadium Aiea, turn left at the stop light and remain in the left lane. Continue on to HI-78. Take the first right turn into Ford Island Blvd. Once you get through the security checkpoint, drive over the bridge. At the roundabout take the second exit. You are now driving on the right hand side of the runway. Continue until you see the "NOAA Inouye Regional Center" sign on the right side. Plenty of parking is available. The sanctuary office in Līhuʻe, Kauaʻi, is a small office in a commercial office complex that serves as the base of operations for sanctuary programs on Kauaʻi. The office also serves as a venue for scheduled volunteer training, workshops, and meetings. Education and outreach materials are available. Please call ahead to schedule a visit as staff are not always on site. Exit Līhuʻe Airport onto Ahukini Road (570) heading west until the intersection with Kuhio Highway (50). Turn left (west) on Kuhio Highway and drive for less than a mile until the intersection with Nawiliwili Road (58). This is in the vicinity of Taco Bell, Burger King and Kukui Grove (Shopping) Center. Turn left at the intersection, and turn left again at the first intersection (as if going to Burger King). The office is in brown building (Kukui Grove Executive Center) in the Taco Bell parking lot. The office is on the second floor; look for the sanctuary sign on the outside of the building. The office is located at the sign. The bulding is ADA compliant with elevators located nearby. The state sanctuary office is located within the State of Hawaiʻi Department of Land and Natural Resources in Honolulu. Upon exiting the airport take the H-1 interstate east toward Honolulu. From the H-1 take the Punchbowl Street exit (21B) and continue south on Punchbowl. The State Sanctuary office is located in the Kalanimoku Building located on the left just past the Beretania Street intersection. Public parking can be found in the basement level below the building in metered stalls. Take the H-1 interstate west toward Honolulu. From the H-1 take the Vineyard Blvd. exit (22) and turn left on Punchbowl Street. The State Sanctuary office is located in the Kalanimoku Building located on the left just past the Beretania Street intersection. Public parking can be found in the basement level below the building in metered stalls.